HEAVILY beaded Julia Bristow fruit bracelet! 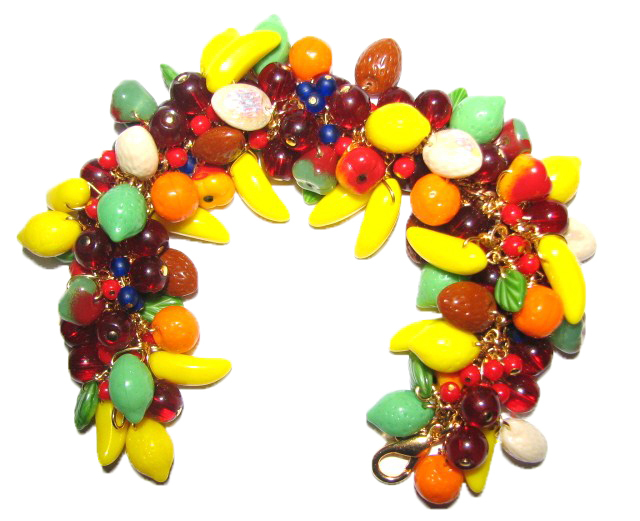 This fruit bracelet is loaded with various mix of Czech pressed glass fruit beads and red round glass beads: Cherries, bananas, oranges, pears, limes, lemons, nuts, blueberries, and leaves on gold-plated chain, signed Julia Bristow. (Please note item shown is example and your piece will vary slightly as each is a one-of-a-kind creation made at time of order.) Please allow two weeks for delivery.